Satsuki announces that she has developed a new “natural election” system. A seven day battle free for all will ensue and those who make it past the week will be able to earn Goku Uniforms for themselves. Ryuko takes Mako to her old house, she flashes back to the day of her fathers death. Failing to find further clues they head home, however they’re scooter runs out of gas. They meet Ira Gamagoori (who just got his driver license), who offers a ride to the gas station. While driving “the automotive and airsoft clubs” attack Ira in an attempt to get his Three Star Goku Uniform, “Shackle Regalia”. Ira goes into a flashback where he recalls first meeting Satsuki. Ira uniform utilizes masochism for power and defeats his opponents. At Honnouji’s surviving students assemble for the “Sudden Death Runoff Election”, however only Ryuko and the “Elite Four” get to the top. Ryuko is challenged by Satsuki to defeat each of the Elite Four, she will in exchange provides details of her father’s death. 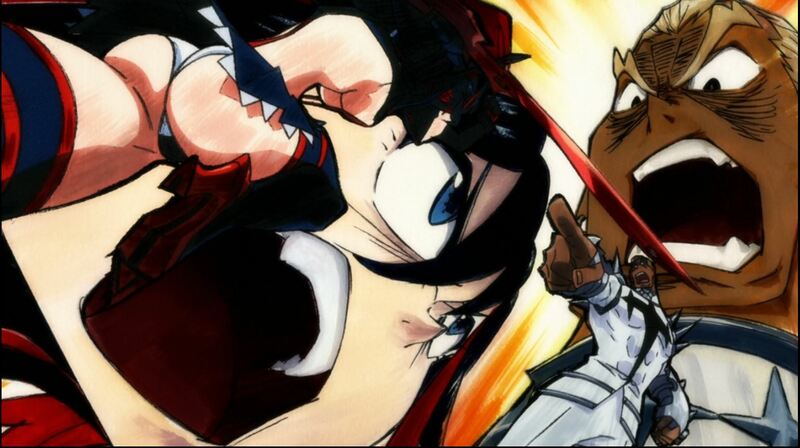 The battle begins between Ira and Ryuko. Aikuro doubts her ability to face and defeat the Elite Four. She is confident in her ability to win. Ira activating his “Shackle Regalia”, Ryuko decides to refrain from attacking him in order to prevent him from gaining power. Ira has a counter to this and proceeds to hit himself, providing that power. Ira tells Ryuko that Shackle Regalia is an armor protecting its own life fibers. Ryuko is pushed into a corner, as she is trapped into a loop of being unable to “damage the Shackle Regalia without powering up the Scourge Regalia form”. Stubborn, Ryuko keeps on attacking Ira to bring out Scourge Regalia’s full power. 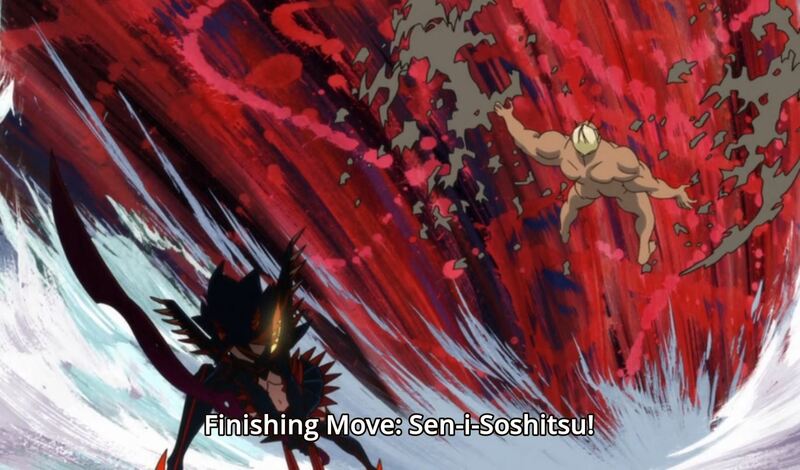 However, Senketsu has a plan, Senketsu uses his fangs to break into Ira’s uniform and releases “Senketsu Senjin”. After Ira was defeated, he attempted suicide but Satsuki prevent him from succeeding. Ryuko now must prepare to face her next opponent, Houka Inumuta.